Tim Keller is well known these days. A Reformed pastor who is hip. An insightful commentator and a successful writer of books for christians. Eight years ago he published The Reason for God, a thoughtful book of what we might term “soft apologetics” – that is, he didn’t try to present strong arguments for the existence of God and the truth of Jesus, but rather suggested ideas that would give readers answers to questions and reasons to believe, without being too “pushy”. I remember thinking at the time that it was good, but probably would only convince those who were already questioning their unbelief. Now he’s produced a follow up which in a sense prepares the way for The Reason for God. Believers and nonbelievers in God alike arrive at their positions through a combination of experience, faith, reasoning, and intuition. So his book attempts to argue that christian belief is culturally relevant, that it makes “more sense of a complex world and human experience” than do secular worldviews. Keller begins with preliminary chapters on whether religion is going away as many secularists hope and on the common charge that religion is based on faith while secularism is based on evidence. Demographic studies that show that religious populations are more likely than secular ones to grow through higher birthrates and greater retention of members, and sociologists of religion now generally accept that secularisation isn’t going to happen as once expected. Keller argues that secularism makes unproven assumptions just as religious belief does, and that for most “converts” out of christianity, rational argument is only one part of the motivating reasons. So, he argues, we should not only look at the obvious evidence and arguments for and against the existence of God, but we should consider the internal coherence of all belief systems, and whether they actually “work” in life, before we make a judgment on which is most likely to be true. And this is what the rest of the book is mostly about. The main section of the book addresses 7 aspects of life where Keller thinks that christianity offers more than secularism, and hence shows itself more likely to be correct. What is the meaning of life? Can it have any meaning at all? Most atheists would argue that there is no “given” meaning to life, we are free to give life whatever meaning we choose. 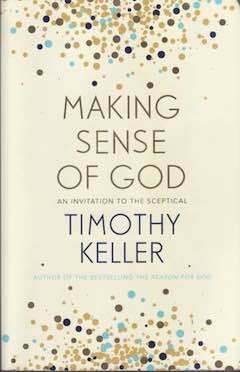 But Keller argues that “discovered meaning” (a meaning which comes from some external, objective source, which christianity says is God) is more rational, more durable and more communal than created meanings (the meaning we may choose to give our lives). I have addressed this question in What is the meaning of life? Our standard of living (in the first world at any rate) has never been higher, and yet many people have deep longings and still feel discontent: “is this all there is?” They develop strategies to deal with discontent – they can live a life of striving to find the thing that will give us satisfaction, or they might assume it isn’t possible and not even try. As you’d expect, Keller argues that christian faith provides the sense of satisfaction that secularism struggles to give. Perhaps the most universal value in modern secular societies is individual freedom to make our own choices provided we don’t harm others. It is a fine sentiment, but Keller argues it is insufficient for a whole variety of practical reasons. One example: if we have different belief systems, we will have different views on what constitutes harm. Religion is commonly seen as an even greater enemy of freedom, but while he recognises the harm sometimes done in the name of religion, Keller argues that christianity gives us many freedoms that secularism cannot give. Keller says that in most cultures in the past, people gained their identity from tradition, culture, God and the roles each person played in their society. But in modern western societies we are urged to get our identity from our own free choices, running our own race. He affirms that this modern approach avoids people being locked into societal roles by privilege or lack of it, but he also argues that this view is a great burden (because our identity depends on our performance, achievements and style) and it doesn’t achieve what is hoped. In contrast, he points out that christian identity comes not from our performance, but from a God who loves us regardless and calls us his children. Suicide rates are climbing in many secular cultures, and polls show that there is declining confidence in the future. Secularists have looked to the end of religion, education and technological progress to produce a better future, but there is increasing pessimism that this will happen. And there is the fact of our own mortality. Christianity offers a hope that God is at work in the world, and that there is a life to come, and this hope is very sustaining. Both christians and atheists can do moral and immoral things, but only christianity provides a reason for moral obligations. Secularism struggles to explain the ethical feelings that everyone has, and to provide a source of the shared morality that all societies need to function. On the other hand christianity offers a reason to believe in moral obligation and a God who can provide a shared ethic. We have a universal declaration of human rights, but where do such rights come from? Religion, including christianity, has been a force for justice and human rights, but also a source of oppression, but the same is true of secularism. But christianity provides a basis for human rights that secularism cannot provide. The book concludes with two chapters arguing (briefly) that theism, and christianity in particular, are reasonable. These chapters give a quick overview of the classic arguments that most of us are familiar with, but are intended as an adjunct to the main chapters. I heartily recommend this book. I enjoyed it greatly and was informed by it. I think the matters he addresses are very important and offer strong reasons in support of the truth of christianity. Those looking for “proofs” may feel he offers nothing, but I think his discussion is convincing for three reasons. He is arguing that christianity is a more coherent belief than secularism, that it is more internally consistent. This is an important test for the truth of any belief; in fact coherentism is a well-established philosophical view of how we can know truth. Scientific (and historical) hypothesis are tested by how much of the evidence they explain. Keller argues, successfully in my view, that christianity can explain the ethics and sense of self most of us intuitively feel, and the meaning and life satisfaction we seek, while secularism cannot do so well, if at all. In our day-to-day lives, we often judge something by whether it “works”. When considering religion, this certainly isn’t the only factor to consider, but surely it is one factor – and it is a factor that Keller shows works in christianity’s favour. One of the most helpful aspects is the references – 69 pages of them. He has read widely and provides lots of useful quotes and insights. I will be using this book to provide input to this website for some time. Filed Under: Life Tagged With: Christianity, Ethics, Faith, Healing, Justice, Life, Meaning, Religion, What is human? « Do we need God for life to have real meaning?